Want to Know More about Rights and Responsibilities Involving Service Dogs in Private Businesses and Public Spaces? Join us for an overview and panel discussion of service animal law. Please call 213-213-8115 if you need a reasonable accommodation or an interpreter. Interpreter requests must be made no later than Friday, June 8, 2018. Fruit Carving by THAIS Inc. Experience the magic of train travel on Saturday, July 14 from 10 a.m. to 5 p.m. at a FREE family event that will showcase the storied history and inventive future of trains. Train enthusiasts will be treated to a rare collection of beautifully restored vintage train engines and cars from the 1940s, 50s and 60s, and will experience the future of train travel with rarely seen train cars from Metrolink and Amtrak. Model Train displays, virtual reality stations, a Kids’ Zone, vintage automobiles, L.A.’s premier food trucks and music from the city’s hottest DJ’s will keep the festivities “on track” throughout the day. Don’t miss out on this fun, family event— reserve your spot HERE! Check in at the Union Station Information Booth for a festival map and free Event Passport. Be one of the first 1,000 guests to complete the passport and receive this commemorative Summer Train Fest pin! Exactly seventy one years ago this month, something crashed in the New Mexico Desert near the town of Roswell. It was an actual thing. It actually crashed. Beyond that fact, we just have stories which have mutated into the modern UFO mythos, with this fallen object at its foundation. For this Paranoid Machines incident, we’ll unpack some of the epistemological tangle of the Modern UFO, and look at how it relates to something that happened a little ways down the road from Roswell, exactly seventy three years ago this month — the Trinity test. Road trip slide show included. Might talk about Q. Might get silenced by DeepState. Who knows?? Find yourself in front of “FULL HOUSE RESTAURANT” located at 963 N. Hill Street in Chinatown. Locate the alley on the left hand side of Full House. 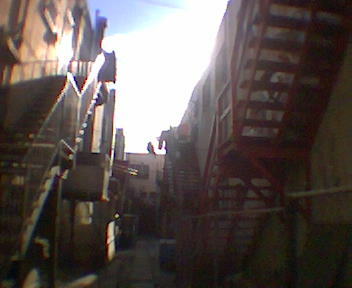 Walk about 20 feet down the alley (away from the street). Notice dumpster on your right hand side. Take a right and continue down the alley. behind a red door, down a black staircase. Held in conjunction with the 7/28 Chinatown Summer Nights Event 5pm-midnight. Eastern Projects – Opening reception for All Lit Up! Held in conjunction with the 8/25 Chinatown Summer Nights Event 5pm-midnight.